Home » Coast to coast » Baltimore SCLC leader announces May 11 march on D.C.
Excerpts from a talk by the Rev. 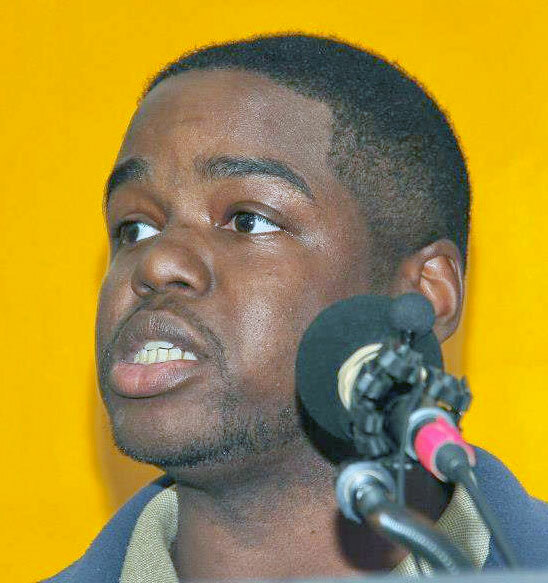 Cortly “C.D.” Witherspoon, president of the Baltimore area Southern Christian Leadership Conference and co-founder of the local People’s Power Assembly, to the Black History Month meeting at the Solidarity Center in New York on Feb. 23. We are excited to be here because we believe that the relationship between the Black struggle, the struggle for socialism and the struggle to defeat capitalism does have an interconnectivity. It’s especially the ability to be able to stand up for the oppressed and to stand down the issue of oppression. We are from Baltimore, and we’ve gone around the country telling the people that Baltimore is increasingly becoming the police brutality capital of the country. Last year we had 15 police murders. We refer to the murders as police terrorism. We’re not concerned about terrorism across the seas. We’re concerned about those right here at home who are killing our children, our young men at taxpayers’ expense. And so we began to organize around this crisis of police brutality. We realize that police brutality is essentially a symptom of a much larger issue that all of us are familiar with. People of color experience this crisis, but it’s also poor people, the people in the low economic echelons. We are cognizant that the same people killed by the police are having recreation centers shut down in their neighborhoods, are having schools shut down in their neighborhoods, are having elected officials who are not responsive to their issues. We recognize that there are also people from the lesbian, gay, bisexual and transgender communities who are experiencing terrorism by the police. So what we’re going to do is we’re going to commemorate the Rev. Dr. Martin Luther King, his struggle and the people who fought in that struggle, that international biracial movement. On May 11, we in the Southern Christian Leadership Conference and the People’s Power Assembly and others are going to march from Baltimore to Washington, D.C., and we’re going to have people from all over the country come out to participate in this march. We’re going to look at the workers’ rights issue. We’ll be working with our Walmart people, who have got a major crisis over there. We just had a meeting the other day with another labor group, UNITE HERE. So we’re exploring some other issues with relation to workers’ rights. We’re going to work with the family of Alan Blueford out in Oakland, Calif. We’re going to go out there next month. We’re also going to work with the families of other police brutality victims across the country. Because we recognize the connectivity of this type of brutality. As we look at the issue of police brutality, as we look at the issues of defeating capitalism and defeating poverty, we recognize the same communities are being disproportionately targeted by these types of crises. We’re cognizant of the fact that the same issues that are happening in D.C. are happening in Baltimore, and they are happening in Oakland, they’re happening in New York, they’re happening in Chicago. Wherever there is a concentration of African-American or marginal income people, Latino brothers and sisters, LGBT brothers and sisters, we see we are all in this struggle together. The system wants us to think that we are disconnected, but there is more that unites us than divides us. So we are going to come together on May 11, and we’re going to come together from around the country because we are cognizant that the only way we can win is if we stand together. We have to be cognizant of the beast we are fighting against, and the beast’s name is capitalism. We have to come together. We’ve got to slam capitalism, and the only way we can do that is to stand together. We look at 2013 — it is a very, very significant year in the history of the struggle. We like to think that this is a year to renew, to re-inspire and to recommit to the struggle. Sister Monica Moorehead did an eloquent job in articulating the fact that this year is the 100th year of the birthday of sister Rosa Parks and 100 years since the death of Harriet Tubman. It is the 50th anniversary of the March on Washington. And not just the March on Washington, it was the March on Washington for Jobs and Freedom. We have to be ready to articulate the ties between the Black struggle and the ties between socialism and fighting for these issues. We have a unique opportunity to rekindle the struggle that woke up this country, to revive the interest in the issue of race and the issue of class, and in this climate in which we see the relationship with issues of equality and the relationship to the issues of LGBT rights. This gives us the opportunity to fight on the issues that bring us together, to have a oneness and an open-mindedness that put us in the direction of progress. And so I’m excited to be here today at Workers World — whenever I have an opportunity to be here — because when I look out over this vast sea of diversity, I see that this is the vision that Dr. King had for the entire nation. We know that we need each other.